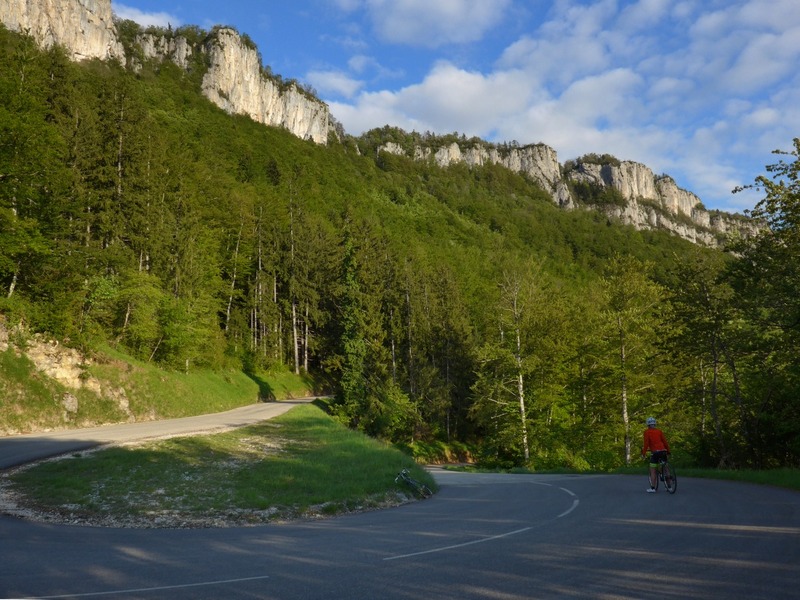 This ride came hot on the heels of the Lac Léman sportive. In fact it was the very next day. 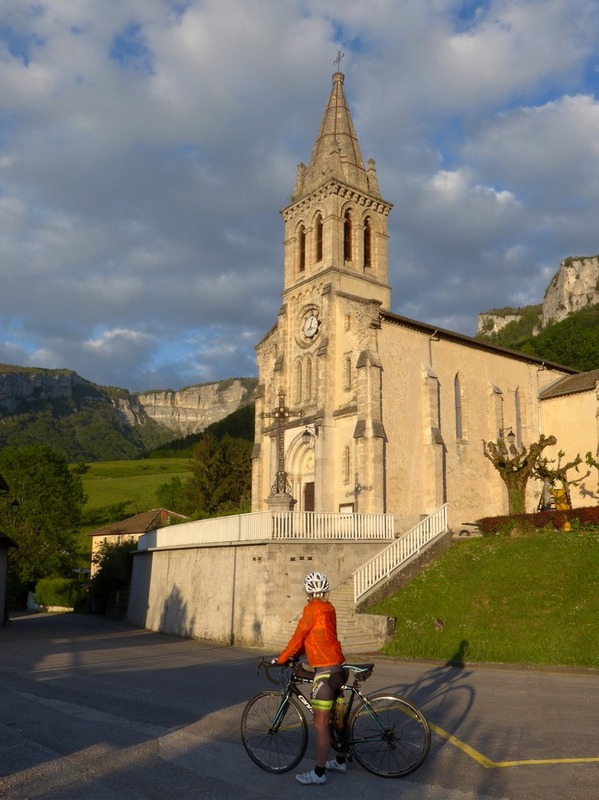 We left Lausanne at just after ten in the morning and arrived, 180 miles later, at St-Jean-en-Royans, in the Vercors region of France, by 1:30PM. Typically at that time, there was no one around and we had to wait until after lunch before we could enter the site, park the van and get on our bikes. The woman on reception showed us the various lovely excursions around the area and assured us that the route we intended to ride was not possible by bike! We thanked her for her help and went and did it anyway! 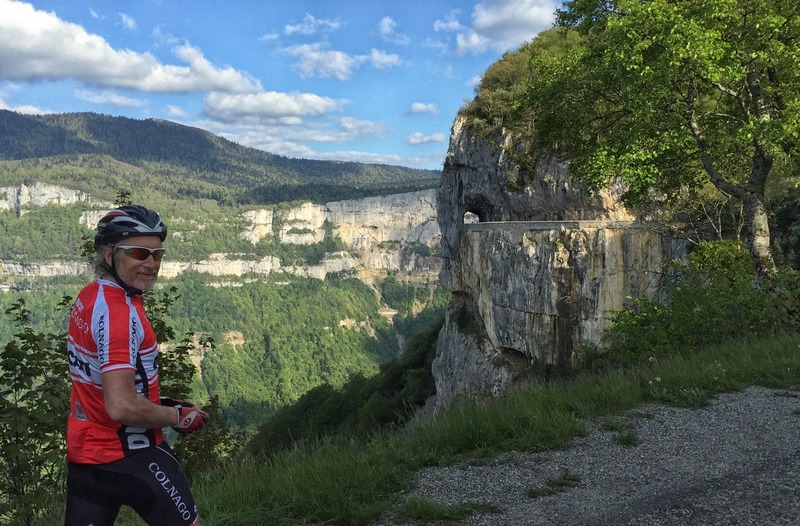 For the preceding six months I had become obsessed with this area of France after reading an article in Cyclist magazine. I had scoured the web for images, driven along the roads using Google Street View and watched other people’s videos on YouTube. I simply had to go there myself! And, lo and behold, here I was! In the end we didn’t set off until 5pm. It was a beautiful sunny afternoon. 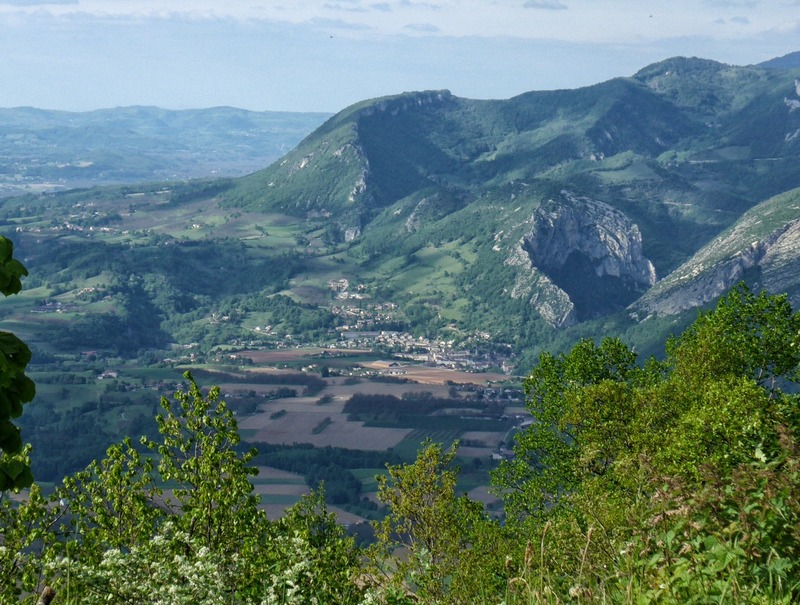 The road out of Saint-Jean-en-Royans started climbing immediately with five miles at a steady 8% gradient. It took us an hour at a leisurely but consistent pace. I had made a mental note that the climbing ended at 12 miles. So we still had a way to go, but now it got easier. In just about another mile’s time, we were at the ‘good’ bit that I had been waiting for. To our left we could see where the road we were on became a ‘balcony’ road, carved into the side of the rock face. We stopped to take in the view. I continued round while Anne waited to get a photo. The reason I’m so small in the photo is that I was crouching behind the ridiculously small guard wall. I couldn’t bring myself to walk right up to it, knowing there was a sheer drop the other side! The scenery was simply spectacular. 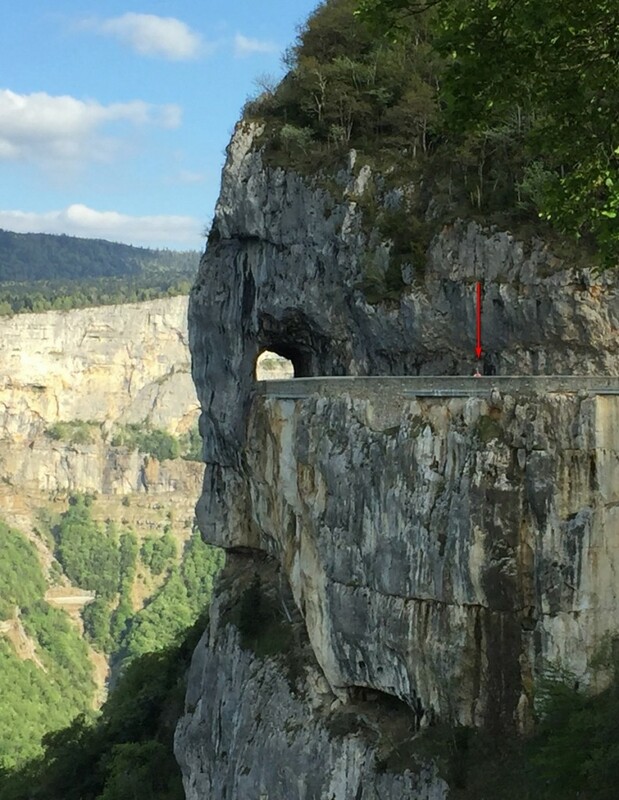 On the other side of the wall was a 550 m (1800 ft) drop down to the Route de Laval, the road that follows the course of Le Cholet river through the gorge below. For the next two miles the road we were on clung to the rock face with the gorge to our left. We were still climbing. 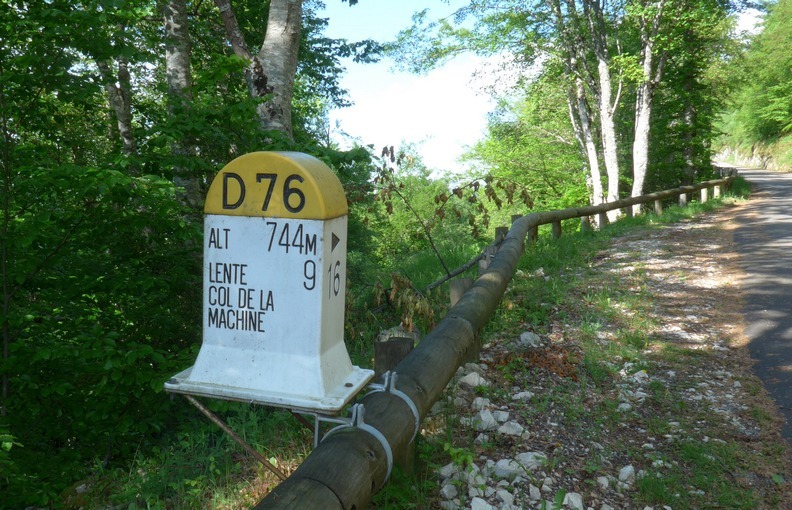 When we reached le Col de la Machine, at 1015 m (3330 ft) we were at the end of the gorge and the road headed through a more wooded landscape as we continued to climb, up and over the Col de Portette at 1175 m. We were 12.5 miles into the route, and I knew that it was (nearly) all downhill from there. There then followed over 10 miles of continuous descent, down to Oriol-en-Royans. Once again the views were spectacular and I was constantly interrupting my downhill enjoyment by stopping to take photos. Because it was late in the day, the low sun was lighting the tops of the rock face with a yellow light. 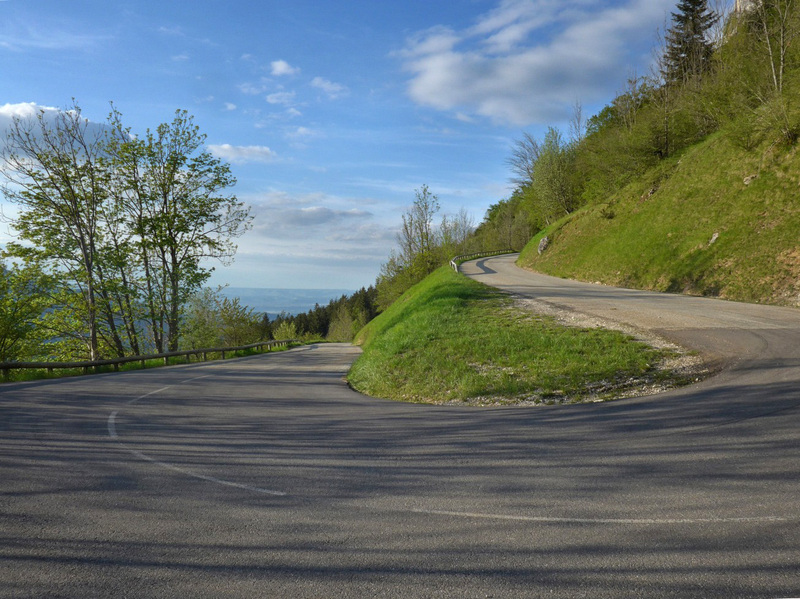 I should really qualify “downhill enjoyment”; It was an amazing descent with smooth roads and beautiful views, but it was now 8 o’clock in the evening and, as we were not properly dressed for this, we began to cool down a little too much. It really took the edge off this part of the ride. By the time we reached Oriol-en-Royans we were uncomfortably cold and were keen for it to be over. 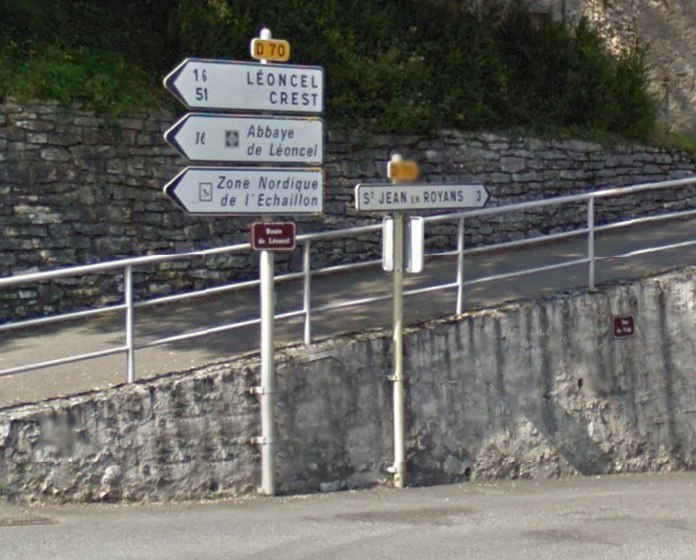 So Anne was pleased when we saw this sign: “Only three clicks to Saint-Jean-en-Royans”, she said, with a sense of relief. But she was definitely pretty far from pleased when I then said “but we’re not going that way. The planned route goes to the left”. (And we must always stick religiously to what the Garmin says, no matter what!). 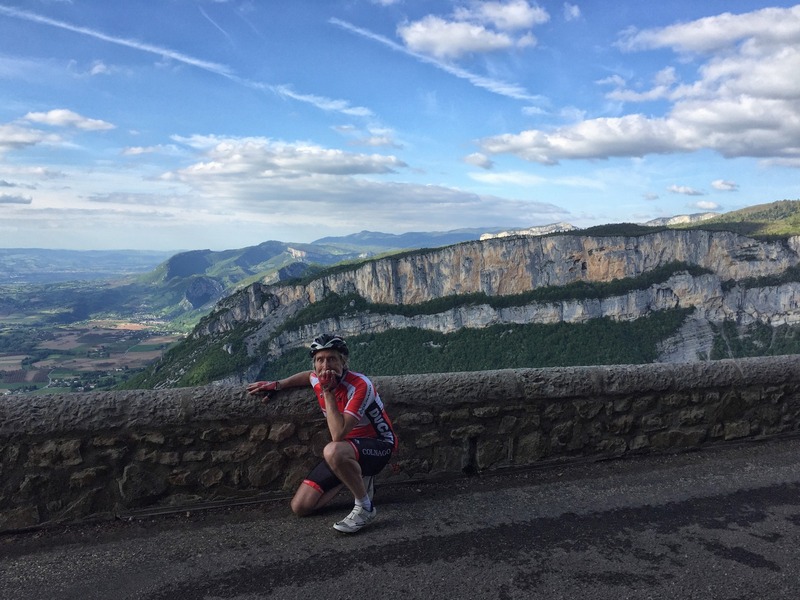 There was worse to come as the (4 miles) longer ‘scenic’ route included a 12.5% climb! We eventually got back at gone 10 o’clock. Once we had thawed out and Anne was talking to me again we both agreed it had been a great ride.